Anzac day is more sacred than any religious holiday to most Australians and results in many young people going on a pilgrimage to Anzac Cove in Turkey on the 25th of April every year. Why then does this day make me angry? The soldiers who fought in the 1st World War deserve all the admiration than can get for their heroic exploits at Gallipoli and the Western Front. It is their leaders who make me angry for sending the pride of Australian manhood to be slaughtered for no other reason other than to gain a few yards of muddy ground. Consider the statistics: of a population of only five million people, 416,809 enlisted – 13.43 % of the white male population and probably about half the eligible men. Australian deaths totaled 61,720 out of 331,000 who served overseas. Of these 155,000 were wounded. Causalities totaled 216,720 or 65.47% of those that served overseas. 18.65% of the soldiers who went overseas were killed. 4.33% of Australia's population was killed or wounded. Top: Badlt shelled main road to Bapaume. Left Upper - Sopwith camel. Left Lower - vickers Machine gun crew with Gas Masks. Right Upper - Tank crossing trench. Right Lower - HMS Irresistable abandoned. The ongoing results to the young nation must have been terrible with husbands and fathers not returning. Some of the wounded would have to be supported for life either by their families or the government. Travel to any town and there is a war memorial showing the names of locals killed and it emphasises the carnage of WW1. Is it any wonder that Anzac Day is so important to the Australian people? How could this happen? What makes young men volunteer in their thousands to fight a war that would have no affect on Australia? Answer: innocence and a sense of adventure. At the outbreak of the War in Europe in 1914, Australia was still a very young nation, having been established as a Federation only 13 years earlier in 1901. The public enthusiastically pledged their allegiance, with thousands of Australian men immediately volunteering, duped into thinking they were fighting for Australia and the British Empire when in reality the security of their nation was not threatened. Australia was not alone in this carnage, a total of 22 nations fought on the allied side including Great Britain plus other Commonwealth Dominions, France, European Nations, the United States, and of course Germany together with Turkey, Austria-Hungary, and Bulgaria suffered the loss of almost a generation of young men. And that is without considering the civilian casualties. Millions of naïve young men were served up for incompetent leaders to exploit and, with little regard, the leaders sent them to their deaths against modern weapons in a war fought with a Crimean War mentality as if the machine gun and awesome artillery didn't exist. 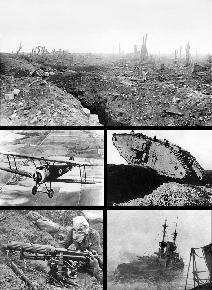 So, what lessons did we learn from the slaughter of World War 1? Not much it seems. In World War 2 Australia's casualties were much lower and the war was fought under the control of mostly Australian commanders and not the British, although Australian bravery came through against the egotistical General Macarthur. Young men are still volunteering to fight for causes that don't stand up to serious examination and so the slaughter goes on. Perhaps, I should feel lucky to be able to express my thoughts. If my father had good hearing and was accepted by the Army in 1915, when he volunteered before I was born, then maybe I wouldn't be here. Is it any wonder Anzac Day makes me both proud of our fighting men and angry that they had to fight in the first place?